LAS VEGAS (SGIA EXPO, Booth #2523), October 18, 2018 – AnaJet, a Ricoh company, today unveiled the latest of its strategic investments to enable customers to produce high-quality, high-margin prints. The new RICOH Ri 1000 Direct-to-Garment (DTG) printer delivers incredible flexibility and image quality in an affordable, easy-to-use package, perfect for both new and experienced users. The RICOH Ri 1000 will be on display in booth 2523 at SGIA EXPO, October 18-20 in Las Vegas and available to order in the US through AnaJet with shipments expected in Winter 2018. 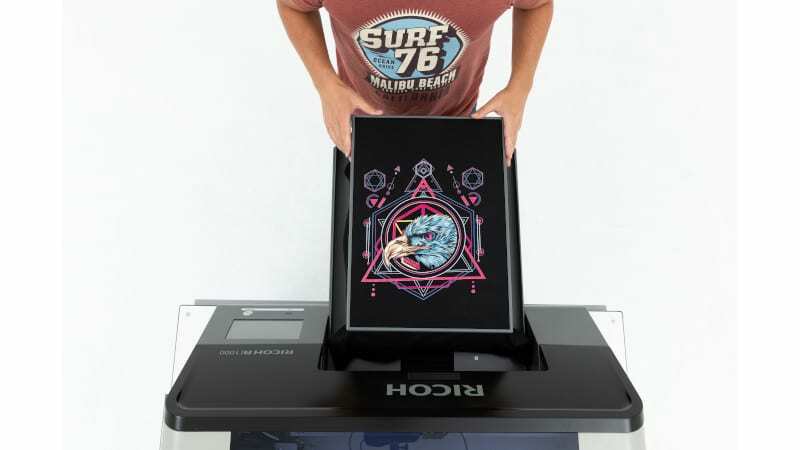 Additionally, Ricoh’s booth, 3601, will be centered around two pop-up retail stores that will demonstrate practical, real-world applications that can be produced on AnaJet DTG printers and Ricoh’s wide format portfolio. 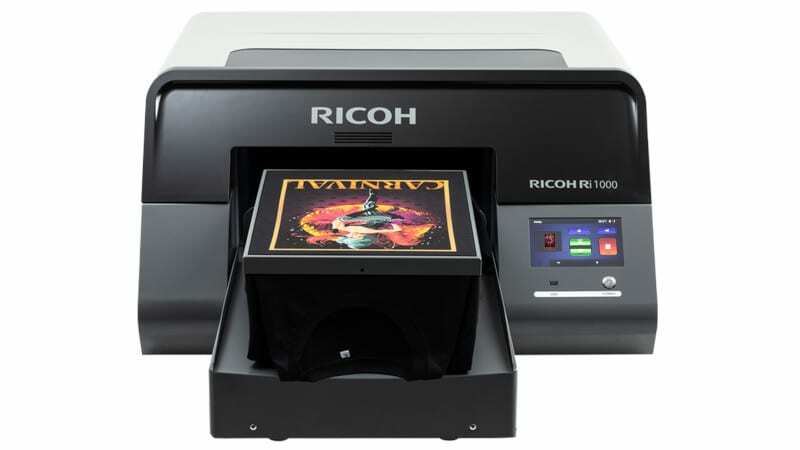 The next-generation RICOH Ri 1000 delivers advanced DTG printing at an affordable price. The RICOH Ri 1000 prints full color graphics at 1200 x 1200 dpi on garments of a diverse array of sizes, colors and materials. Quick-change magnetic platens, available in multiple styles and sizes up to 16 x 19.6 inches, provide a variety of print options. These platens easily snap on and off the machine, so switching between different garment styles and sizes requires virtually no downtime. All RICOH Ri 1000 platens are dressable, which provides hassle free loading, precision printing and garment protection. Additionally, the RICOH Ri 1000 boasts durable steel construction, including a Ricoh-designed high-performance print engine and Ricoh print heads. The printer’s specialized carriage and table design help deliver high-accuracy images, even while printing at speeds up to 28 seconds for a full-color, 10 x 8-inch CMYK graphic. The RICOH Ri 1000 offers time-saving features like magnetized quick-change platens, intelligent auto clean, white ink agitation, and a built-in Interactive Operation Guide that provides reminders to complete necessary tasks. The RICOH Ri 1000 was designed with “walk-up ready” ease of use in mind. Automated maintenance sequences clean print heads and agitate white ink regularly, saving operators time and making the device easier to use and maintain. The RICOH Ri 1000 continuously monitors its ink supply, air level and dampers, adjusting where necessary so it is virtually always ready to print. For those maintenance tasks that aren’t automated, the device’s 7-inch touchscreen display includes a built-in Interactive Operation Guide, which provides alerts reminding users to perform manual maintenance tasks. This touchscreen also allows for intuitive job and workflow management. The RICOH Ri 1000 will ship in the US in Winter 2018 with international availability announced at a later date. For more information on Ricoh DTG printers at SGIA EXPO, visit www.RicohDTG.com. See everything Ricoh has to offer by visiting www.TakeALookAtRicohProduction.com and follow along and engage on Facebook, LinkedIn and Twitter. Press kit, including images of the RICOH Ri 1000 and Ricoh DTG printer family. AnaJet has been a true pioneer in the direct-to-garment printing industry starting with the mass production of its first printer line in 2006. AnaJet became a Ricoh company in late 2016, and the two immediately united to begin research and development on the flagship RICOH Ri 3000/Ri 6000 printers. In 2018, AnaJet launched the ground-breaking Ri 100, which was named a 2018 CES Innovation Awards Honoree. AnaJet continues to set the bar in the DTG industry, constantly striving to create market-leading products with superior print speeds, reliability and ease of use.